Allowing children to relax and be themselves, and to run around to get the yayas out, can be an immense help on a busy and hectic wedding day. Just because the wedding is at a fancy venue like The Breakers on Palm Beach Island doesn't mean that the children in the wedding are going to behave any differently than any other venue! We like to over-schedule the time needed for family formals when there are young children involved in order to give them time to run around and get a little messy, allowing their natural exuberance to shine, and maybe making the wedding day a little more fun for something in their age group. This has the added benefit of letting us capture images of the children being natural, happy, and childlike, which contributes toward delivering a variety of images freezing the wedding day in time. 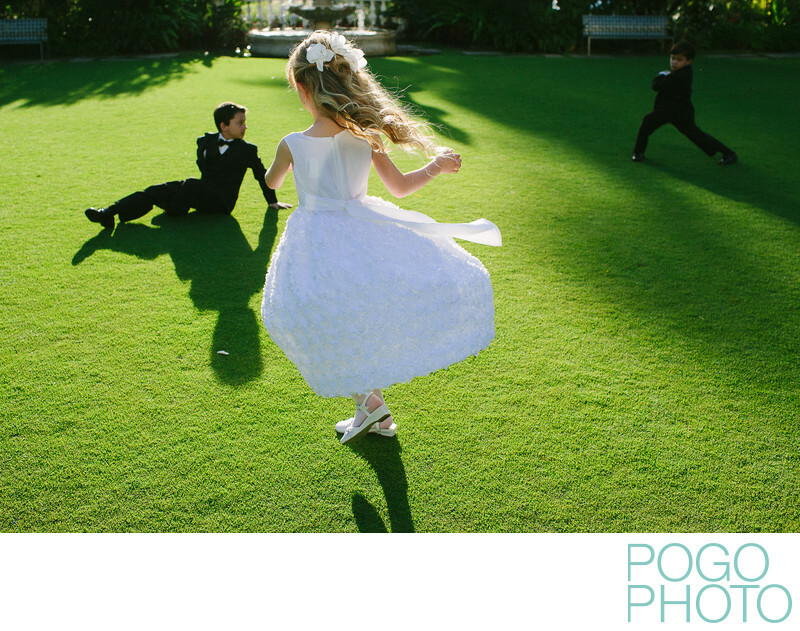 This late afternoon shot on the front lawn of The Breakers shows the flower girl and ring bearers from this elegant wedding finally getting a chance to run off some excess energy. As soon as we told them to go run around for five minutes they lit up and immediately started playing, spinning in circles, running around each other, falling over, and laughing. The deep shadows from the setting sun make this image feel nostalgic and fleeting, with a graphic element to keep it feeling modern. Location: The Breakers, Palm Beach, Florida. 1/2000; f/4.0; ISO 400; 35.0 mm.